If you live in an area with porcupines, you need to be aware of how dangerous they can be if you have a dog. You don’t have to live way out in the country for a porcupine to cross paths with your pooch. Removing porcupine quills is something that takes some knowledge to do correctly. You cannot just go and pull them out since they are barbed. Scout has researched how to remove porcupine quills from your dog and when to know when it is time to get your veterinarian involved. Loss of Consciousness, Impaired Breathing or Major Swelling. If you live near a wooded area, your dog is at risk for meeting up with the North American Porcupine. The North American Porcupine has about 30,000 quills. Each quill boasts 700-800 barbs that could end up in your dog’s skin. This is why removing porcupine quills out of the skin isn’t as simple as giving it a pull with tweezers or needle-nosed pliers. The barbs latch into the small incisions in the skin, and can cause damage to your animal if you don’t proceed with caution. Contrary to popular belief, the North American Porcupine cannot shoot quills; the dog must come in contact with the porcupine to experience the painful effects of this natural defense mechanism. There are times when you should leave it to the professionals. Here are some guidelines for knowing when to get to the vet ASAP. When dogs and porcupines come in contact with one another, it usually means the dog has jumped in face first. As such, it’s no surprise when they get a quill or two in their eye, mouth or nose. More than ten quills on a large dog mean you should get to a veterinary clinic right away. That many quills are extremely traumatic and an inexperienced person is going to take a long time to remove them, causing tissue damage if they don’t handle the barbs appropriately. Porcupine quills in dogs can cause serious skin and tissue damage. If you cannot safely remove them from your dog because they are too agitated then you definitely need to go to the vet. At the veterinary clinic, your dog might be put under a general anesthesia, depending on the severity of the attack. At the very least, they will be given pain medication. Depending on the policy at your local animal medical center, your dog may have to wear a muzzle for the removal if they are extremely agitated. This experience will likely be upsetting for you both. Take your dog to the nearest emergency animal medical center or hospital immediately if they experience any signs of losing consciousness, impaired breathing, or suffer from other conditions that could affect their ability to recover. If a needle has penetrated very deeply you will want to let a veterinarian remove it. It is rare that porcupine quills in dogs are deep enough in the body to hit vital organs, so try to remain calm. If quills have gone through your dog’s mouth, then they could be far enough back in their throat to make it impossible to drink or eat. If quills are deep then get to the vet right away! They may have to put your dog under general anesthesia for the removal process. If you live too far from a veterinarian clinic or just have a few quills to remove, then it may be done at home. To remove quills, follow the guidelines and steps below. Remember, never break or trim quills before removal. While it may seem like you are making them easier to remove and allowing them to deflate, you are actually making it more likely that you will break one off and leave fragments behind. When this occurs, infection is likely and abscesses could form, and the bits will have to be removed anyway. You really need to have someone on hand to help restrain your dog. Struggling can lead to quill breakage or the quills being pushed in deeper. 1. Examine your dog to determine the location of the quills. Make sure that quills are shallow enough and not located in too sensitive an area, such as the mouth or an eye, for you to remove. 2. Calm your dog. If they can eat, you might offer them a small bite-sized snack. 3. Have a trusted person hold your dog. You both need to be on guard for any snapping or biting. This is a painful process and even dogs that are normally the sweetest in the world to everyone around them might be blinded enough by the pain that they accidentally nip or struggle a lot. Consider using a muzzle if possible. 4. Have your helper cover the dog’s eyes and offer comforting words. Make sure no one speaks in a raised or agitated voice. While this is no doubt a tense situation, you will make it far worse on your dog and you by not remaining calm the whole time. Do not give your dog any human pain medication. 5. Grasp the base of the quill firmly but not so hard that you break it or leave the barbs lodged in the skin. Pull quill out straight in the opposite direction it went in. Do this fast. A quick motion removes them with less pain and reduces the chance of breaking off a tip. While you may take a lot of care to not break a quill, it can happen. Dogs also can sometimes come in with broken quills already because they use their paws to hit at the quills or try to rub their head against something trying to rid themselves of the pain. You must remove broken pieces so that abscesses don’t form, causing severe health issues. 1. Sanitize some tweezers. This can be done by washing tweezers with soap and immersing in boiling water for 5 minutes, removing, and then allowing to cool for another 5 minutes. 2. Use tweezers to carefully reach in and remove the broken off quill. If there are multiple broken quills or you are unsure if you got all of it out, then get your dog to your vet as soon as possible. Keep a close eye on the areas where you removed quills from your dog’s body. If you see any signs of anything flaring up, lumps, or increased swelling, then get to a vet. Infection is a real risk with porcupine quills so some dogs may require oral antibiotic treatment. Keep the affected areas clean using disinfectant wipes and apply ointment until completely healed. Scout recommends keeping the following products on hand if you live in an area where porcupines are a problem. Of the items below, the hemostats or pliers are the most crucial items to own and of course something to disinfect the wound. 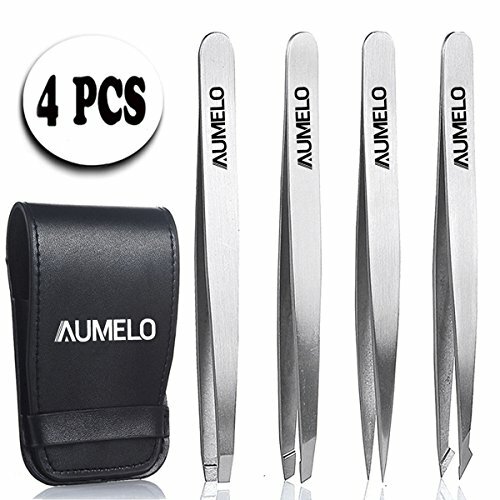 A tweezer set is an excellent addition to any dog medical kit. It makes it so much easier to remove objects from the skin or tweeze irritated and ingrown hairs on your dog. 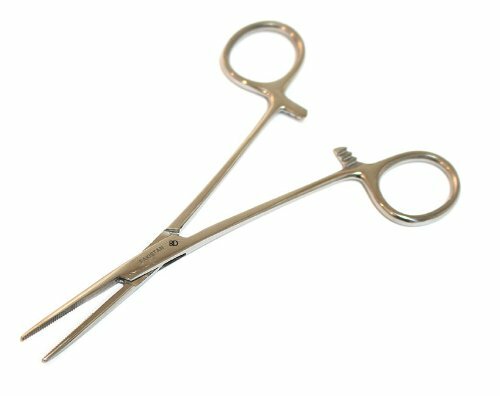 Hemostats allow you to carefully lock down on something so it cannot slip. This is likely what a veterinarian is going to use to remove quills. Any good dog medical kit should have one or more pairs of hemostats. You can get them straight or curved. For quill removal, straight is preferred. 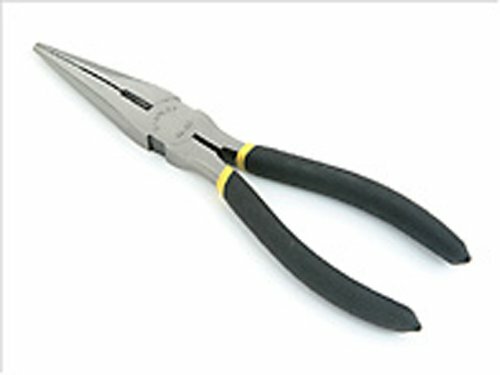 Needle-nosed pliers are handy to have in general but they can be used to remove quills. Just be careful to not grip the quill too hard. 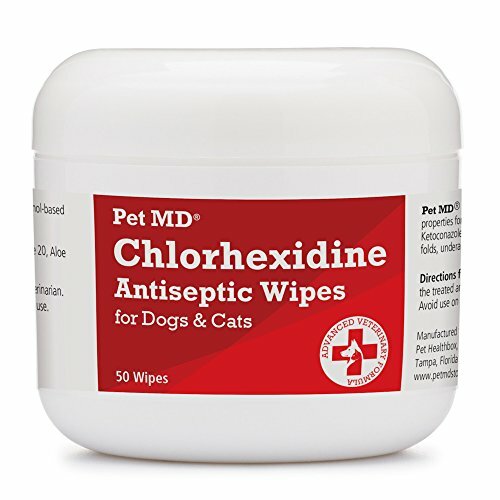 Antiseptic wipes are great because they allow you to gently clean the entire area of a wound or injury so you get a lot of the hidden dirt, grime, and assorted germs. These are very affordable and gentle. Good aftercare is important to ensuring infections stays away and your pooch heals as fast as possible so they can get back to doing what they love. 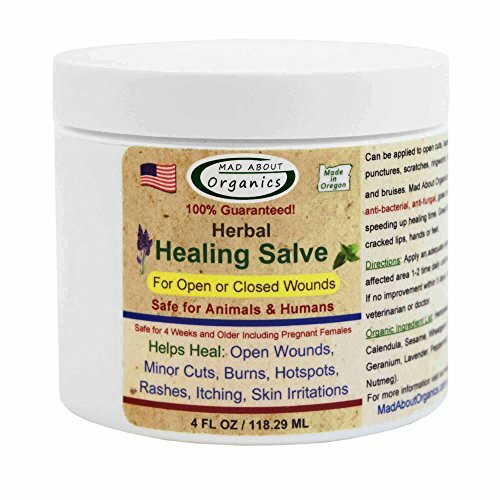 This organic healing balm keeps germs out and encourages healthy cell renewal. 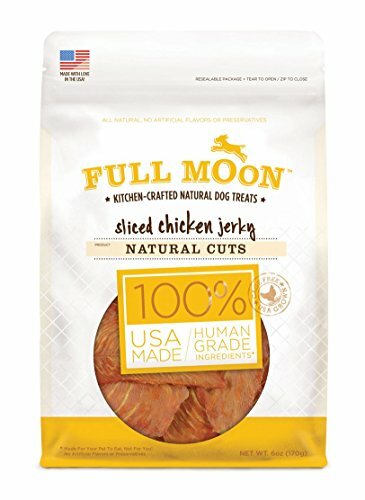 Treats help calm and soothe a dog and after anything traumatic, they deserve a good snack! Dogs and porcupines are not meant to be buddies. Night time encounters with small wildlife are very common near wooded areas. It is much easier for dogs to get into a mess that you are not awake to see. While I realize that some dogs are working dogs and need to be outside at night defending the home and livestock, other dogs can avoid wildlife interactions by just sleeping inside at night or being confined to a smaller acreage than they are normally allowed. If you have a big piece of property or hit the trails with your dogs often then they can be exposed to more wildlife in general. Keep a dog on the leash when touring through wooded areas. Porcupines like big patches of property. If you move into a place and start turning your dog loose unsupervised it may lead to some incidents. A lot of dogs will let you know when another animal is around. If you hear distressed barking or a different type of tone than usual, take a look. If you can avoid any up-close interactions involving a small animal and your dog, you will be better off. Sometimes just a little awareness means you can scare something off before the situation escalates. Porcupines like to chew on trees. If you see damage to your trees and foliage then you can spray hot pepper sauce on them to deter porcupines from feeding. Fences will help, but to completely prevent porcupines you need to have a fence that has small enough gaps that they cannot get through at the bottom. The bottom of the fence also needs to extend 12 inches below ground to prevent them from digging in. Trapping and releasing them somewhere else is possible if you are comfortable doing this. In some areas, animal control can help you out if one wanders into your yard. One thing that dog parents really need to learn is that their dog has tendencies. We have a Great Pyrenees that has been sprayed by a skunk on four different occasions but she will still try to get skunks. Most dogs give up after it happens a single time, but some dogs just can’t resist. If you have a hunting dog or just one that has a major defensive reaction when a small animal gets near, you may have to take extra measures to prevent them from getting into trouble more than a few times. Now you know how to remove porcupine quills from a dog. Looking for information on skunks? Check out this post.